Hide deals from seller "The Westin Keirland Resort & Spa"
Hide deals from category "Hotels"
This offer is valid for a Deals Magazine Discount Voucher only. The Discount Voucher gives you access to the $304 for $649 offer for a 3-night stay at Keirland Resort & Spa. Instructions for redemption can be found in the voucher instructions after purchase of Deals Magazine’s Discount Voucher. Do not contact Keirland Resort & Spa to redeem deal. The following terms apply to the Keirland Resort & Spa offer: Limit 1 per person and 1 per transaction. Valid on a 3-night stay at The Westin Keirland Resort & Spa for 1 person. Valid on a Traditional Room. Includes breakfast for 2 days. Children 12 and under stay for free. Special promotion on new bookings only. Prices are per person, based on double occupancy. All prices, rooms and rates are subject to availability. Airfare not included. Trip must be booked by Aug. 1, 2012. Valid travel dates are 8/8/2012-8/11/2012. Promotional value expires Aug. 1, 2012. Escape to the Sonoran Desert with this deal for a $10 Deals Magazine Discount Voucher that grants you access to $345 in savings on a 3-night stay at The Westin Keirland Resort & Spa in Scottsdale, Ariz. ($649 value). This lush desert oasis offers relaxation and entertainment amidst beautifully vibrant vistas. Your stay will begin in one of Keirland’s Traditional Rooms, which is equipped with their signature Heavenly Bed and Bath. The resort offers a variety of dining options that will please the palates of even the most discerning foodies. Deseo, their featured restaurant, offers a lively, Latin-influenced menu created by an award-winning chef, Douglas Rodriguez. Keirland Resort & Spa provides families a host of entertainment options, from pools and water parks to luxury shopping, sports, museums and historical attractions. Keirland also offers avid golfers the chance to hit the links on three championship-style nines, and their luxury spa is the perfect place to spend a peaceful day. 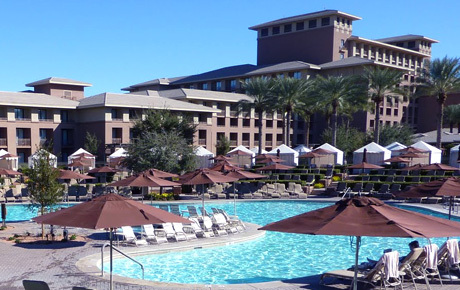 Family-friendly resort and spa in Scottsdale, Ariz., offering a variety of amenities. Once purchased, your Discount Voucher will contain information on how to redeem a $304 for $649 offer for The Westin Keirland Resort & Spa in Scottsdale, Ariz.